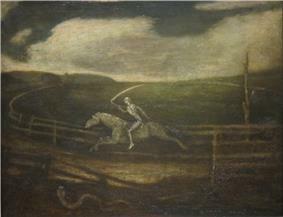 Albert Pinkham Ryder (March 19, 1847 – March 28, 1917) was an American painter best known for his poetic and moody allegorical works and seascapes, as well as his eccentric personality. 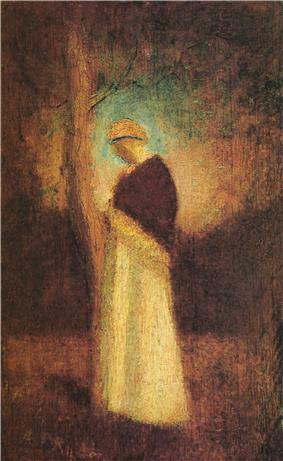 While his art shared an emphasis on subtle variations of color with tonalist works of the time, it was unique for accentuating form in a way that some art historians regard as modernist. Ryder was born in New Bedford, Massachusetts. New Bedford, a bustling whaling port during the 19th century, had an intimate connection with the sea that probably supplied artistic inspiration for Ryder later in life. He was as the youngest of four sons; little else is known of his childhood. He began to paint landscapes while in New Bedford. The Ryder family moved to New York City in 1867 or 1868 to join Ryder's elder brother, who had opened a successful restaurant. His brother also managed the Hotel Albert, which became a Greenwich Village landmark. Ryder took his meals at this hostelry for many years, but it was named for the original owner, Albert Rosenbaum, not the painter. 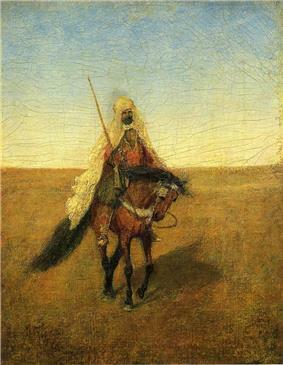 The early view of Ryder was that he was a recluse, holding that he developed his style in isolation and without influence from contemporary American or European art, but this view has been contradicted by later scholarship that has revealed his many associations and exposures to other artists. Ryder's first training in art was with the painter Augustus Saint-Gaudens, Robert Swain Gifford (also from New Bedford), Ryder's friend Julian Alden Weir, John LaFarge, and Alexander Helwig Wyant. Ryder exhibited with this group from 1878 to 1887. His early paintings of the 1870s were often tonalist landscapes, sometimes including cattle, trees and small buildings. The 1880s and 1890s are thought of as Ryder's most creative and artistically mature period. 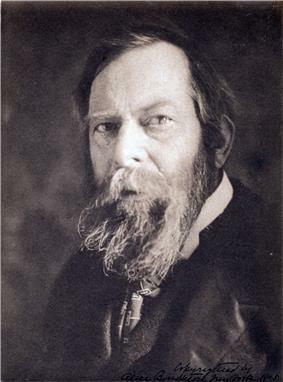 During the 1880s, Ryder exhibited frequently and his work was well received by critics. His art became more poetic and imaginative, and Ryder wrote poetry to accompany many of his works. His paintings sometimes depicted scenes from literature, opera, and religion. Ryder's signature style is characterized by broad, sometimes ill-defined shapes or stylized figures situated in a dream-like land or seascape. His scenes are often illuminated by dim sunlight or glowing moonlight cast through eerie clouds. 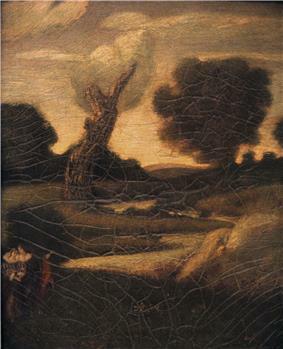 The shift in Ryder's art from pastoral landscapes to more mystical, enigmatic subjects is believed to have been influenced by Robert Loftin Newman, with whom Ryder shared a studio. After 1900, around the time of his father's death, Ryder's creativity fell dramatically. For the rest of his life he spent his artistic energy on occasionally re-working existing paintings, some of which lay scattered about his New York apartment. Visitors to Ryder's home were struck by his slovenly habits—he never cleaned, and his floor was covered with trash, plates with old food, and a thick layer of dust, and he would have to clear space for visitors to stand or sit. He was shy and did not seek the company of others, but received company courteously and enjoyed telling stories or talking about his art. He gained a reputation as a loner, but he maintained social contacts, enjoyed writing letters, and continued to travel on occasion to visit friends. While Ryder's creativity fell after the turn of the century, his fame grew. Important collectors of American art sought Ryder paintings for their holdings and often lent choice examples for national art exhibitions, as Ryder himself had lost interest in actively exhibiting his work. In 1913, ten of his paintings were shown together in the historic Armory Show, an honor reflecting the admiration felt towards Ryder by modernist artists of the time who saw his work as a harbinger of American modernist art. By 1915 Ryder's health deteriorated, and he died on March 28, 1917, at the home of a friend who was caring for him. He was buried at the Rural Cemetery in his birthplace of New Bedford, Massachusetts. A memorial exhibition of his work was held in the Thomas Hart Benton, David Siqueiros and Pablo Picasso—an important influence on Jackson Pollock's paintings. Ryder completed fewer than two hundred paintings, nearly all of which were created before 1900. He rarely signed and never dated his paintings. Ryder used his materials liberally and without care. His paintings, which he often worked on for ten years or more, were built up of layers of paint and varnish applied on top of each other. He would often paint into wet varnish, or apply a layer of fast-drying paint over a layer of slow-drying paint. The result is that paintings by Ryder remain unstable and become much darker over time; they crack readily, do not fully dry even after decades, and sometimes completely disintegrate. Because of this, and because some Ryder paintings were completed or reworked by others after his death, many Ryder paintings appear very different today than they did when first created. Many of his paintings suffered damage even during Ryder's lifetime, and he tried to restore them in his later years. In their book, Albert Pinkham Ryder: Painter of Dreams, William Innes Homer and provenance—a collection of written documentation detailing a painting's ownership history. 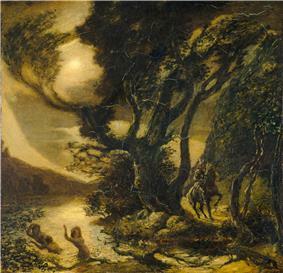 The Spirit of Autumn (c. 1875), the earliest documented work by Ryder. Columbus Museum of Art, Columbus, Ohio. The Lover's Boat c. 1881, Oil on canvas, Smithsonian American Art Museum, Washington, D.C. The Forest of Arden (1888 - 1897, possibly reworked 1908). Oil on canvas, Metropolitan Museum of Art, New York City. The Flying Dutchman, c. 1896, oil on canvas mounted on fiberboard, Smithsonian American Art Museum, Washington, D.C. The Dead Bird, 1890-1900, the Phillips Collection, Washington, D.C.
Seacoast in Moonlight, 1890, the Phillips Collection, Washington, D.C.
^ "Albert Pinkham Ryder". The Hotel Albert. 1911-03-11. Retrieved 2013-12-04.